Gas hot water systems are ideal for when you need an economical and reliable hot water solution. Both continuous flow gas hot water systems and gas storage hot water systems offer quite a low up-front cost, and are a great way to reduce your carbon footprint. At Hewitt Trade Services, we offer a full range of premium brands in gas hot water systems so we can offer our customers a one-stop solution for all of your home gas hot water needs. No. 1 with Australian families. Rheem is Australia’s favourite hot water system, and it’s been that way since 1939 when Rheem started making water heaters in Australia. Generations of Australian families have relied on Rheem for hot water that comes on steady, hot and strong. Rheem gas hot water heaters are available in a range of sizes to suit most needs. Whether you’re a small family on a budget or a larger family with a big demand for hot water, Rheem has the solution that is right for you. 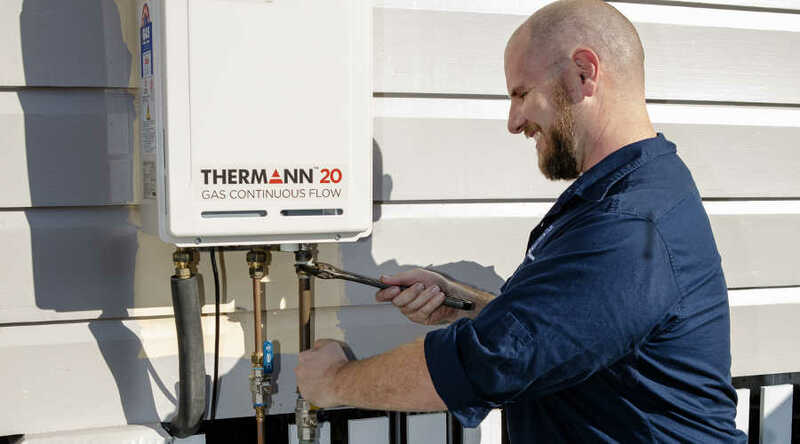 Precision engineered for efficiency and long life, Thermann is setting new standards for hot water systems in Australia. Packed with innovative features and proven technology, Thermann delivers the ultimate hot water experience everyday. 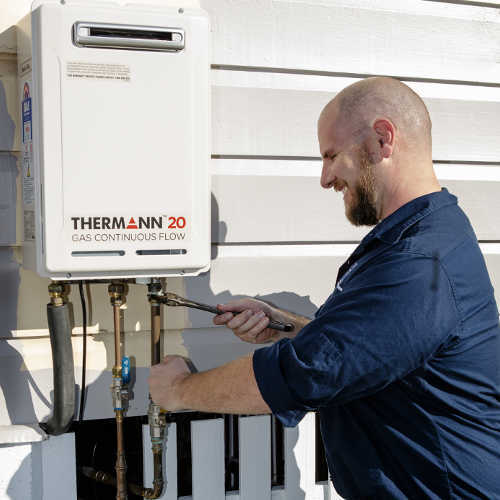 What’s more, Thermann is committed to total customer care, so you’ll enjoy market-leading warranties and full after sales support for many years to come. Thermann gas hot water heaters are quick and easy to install and are available in a wide range of sizes to suit your needs making them an affordable way to get your hot water now. In the early 90’s, Rinnai forever changed the way Australians enjoyed hot water, with their launch of the country’s first fully electronic gas continuous flow hot water systems. It was a revolutionary leap that provided total confidence and comfort by knowing that your hot water would never run out. They called it Rinnai Infinity. Designed with the environment in mind and with leading efficiencies across the range, low emission burners, Puretemp temperature control technology and better water conservation technology. The Rinnai Infinity range takes comfort to a new level. AquaMAX Five Star Gas water heaters have options to cover most needs. As these units are mains pressure, they can keep up with high demands. When you turn on the second, third or fourth tap, the hot water flow remains at mains pressure levels. AquaMAX Gas storage units come in high quality, stainless steel cylinders which store heated water at higher temperatures than standard water heaters and come with 12 Year cylinder warranty*. A quality hot water system can really make a home, and when it comes to performance, Everhot delivers. That’s why so many Australian families choose their reliable systems. Everhot offers a full range of gas storage units for mains water applications, with capacities to suit a range of family sizes and budgets. What’s more, each of their hot water systems come with full warranty backing through the Reece national network. That’s why Everhot is the warmest way to start your day. We supply, install, repair and service Gas Hot Water Systems across Brisbane! Why Choose Hewitt Trade Services? We have over 49 years of experience in the plumbing industry and take great pride in providing superior service and workmanship 100% of the time. We also guarantee our installation so you can have peace of mind that your hot water system has been installed to the highest quality standard. We have an extremely friendly and knowledgeable customer service team available Monday to Friday from 7am to 5pm. Our dedicated team will assist you with any question or query you may have and will continue to provide superior customer support for many years to come. We offer free on site quotes and advice to all of our customers. This is to ensure that we can tailor a home hot water solution that’s the right fit for you. All of our tradesmen are employees of Hewitt Trade Services, not contractors. All of our employees are professional, polite and experienced tradesmen and live locally near you. We are very experienced when it comes to repairing hot water systems, so you can breathe easy if you have an issue. Simply give us a call, and we’ll come fix it for you. We come to you! No need to go and collect a gas hot water system from somewhere, we can supply everything required for your job and bring it with us on the day. We will also come to you for any quote or advice that you require. Hewitt Trade Services have lots of special offers on various products all year round. Check out our current offers!